This is enough to read out the values of the IMU Brick and control the two DC Bricks with a Joystick Bricklet. If you wanted to add lots of sensors to the robot, a small Linux board on the robot would probably be best (such as Beagle Board or Raspberry PI). In this case you could control the robot either directly with the embedded board or you could plug a USB WIFI stick in the board and still control over a PC (use the IP of the board instead of localhost for the connection to the Bricks). We equipped the track vehicle with a Step-Down Power Supply, a Master Brick, two DC Bricks, an IMU Brick and a Chibi Extension. The Step-Down Power Supply is supplied by two LiPO batteries and the gear motors of the track vehicle use about 1.5A each. This works with the DC Bricks without additional cooling. The IMU Brick is mounted at the top of the stack to reduce the magnetic field of the motors. We recalibrated the magnetometer of the IMU with the IMU Brick mounted on the robot. For an optimal result the IMU Brick could have been mounted a few centimeters higher. 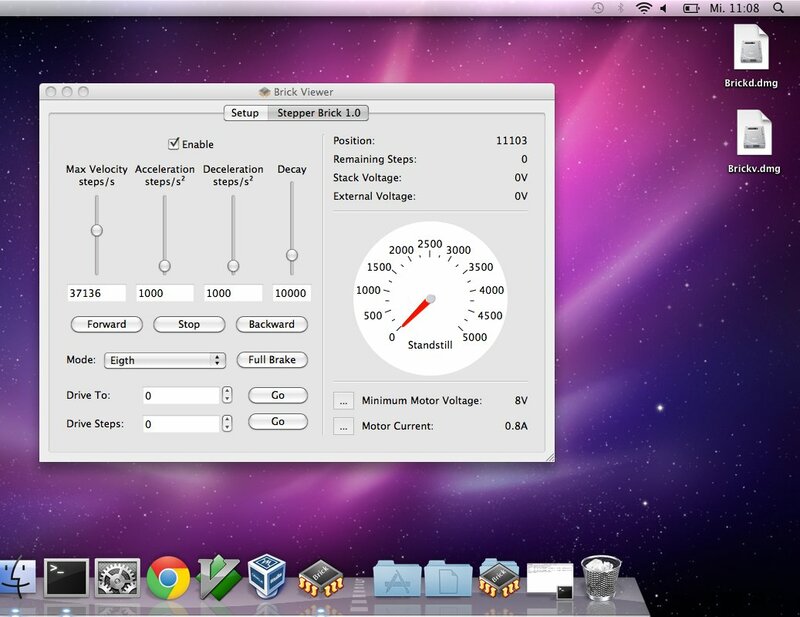 We just uploaded the first beta version of the Brick Daemon and Brick Viewer for Mac OS X. All of our products should now be usable on this platform too! Only recent versions of the operating system are supported (64 bit system, x86). The development took quite a bit longer then we expected, some of the libraries we use have different behavior on Mac OS X than on Linux or Windows. This is aggravated by the fact that we are both no Mac OS X experts. Thus we are declaring the Mac OS X support as beta currently, if you encounter any problems please let us know. The .dmgs can be found in the download area. Small installation howtos can be found here and here. Phew! All of the pre orders are shipped now and at the moment we don’t have any open orders. At this point we have to thank the pre orders for there patience, unfortunately everything took a little bit longer as we had hoped. Nonetheless, we now have the majority of Bricks and Bricklets in stock in big quantaties. We also bought a surplus of the components that were hard to come by. In the future we will be able to reproduce stuff at short notice. An exception are currently the LCD Bricklets, we have still difficulties with them. The LCD 20x4 Bricklets are currently sold out and we are not taking pre orders for them. We will activate pre orders as soon as we have a fixed date. We don’t want to move delivery dates again. There are however still some LCD 16x2 Bricklets in stock. There is more good news for the OS X users. Except for some small details we have the Brick Viewer and the Brick Daemon running on OS X. We will release the first versions very soon. Unfortunately we found out that the configuration of the Chibi Extension was too complicated and too complex. For that reason we have restructured it a little bit. If you had problems understanding the Chibi configuration you can update now, there is new documentation, a new Brick Viewer and a new Master Brick firmware available. The underlying API stayed the same, if you wrote a program to configure your Chibi Extension you don’t have to change anything. Also worth mentioning here again may be our new products in the shop. There is now an Analog In and Analog Out Bricklet, a Step-Down Power Supply with 5V output (you can e.g. power a Raspberry Pi or Beagle Board with it), 1m and 2m Bricklet cables and a Starter Kit for Tinkerforge beginners. 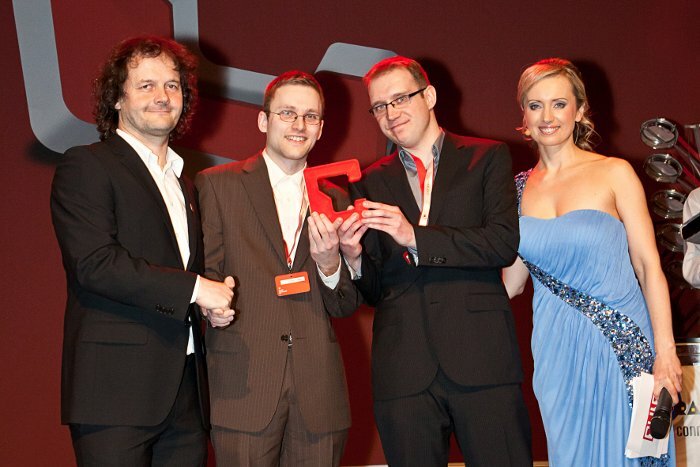 Yesterday we were at the CeBIT, invited by the CHIP Magazine, to take part at the award ceremony of the CHIP AWARDS. Unexpectetly we were allowed to take the price for “Product of the Year 2012″ home! The Awardees of the “Product of the Year” category in 2011 and 2010 were the major players Lufthansa and Panasonic, now it is Tinkerforge :-). A video of the award ceremony can be viewed on website of Chip (video is in english). We are very happy about the award, even though we didn’t quite manage to smile on stage because of the tension. Many thanks to the jury and the CHIP team for the award!